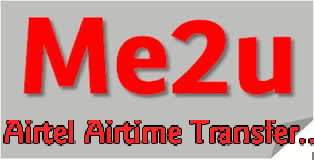 Airtel Me2u Service Balance Transfer- To transfer credit on Airtel to any Airtel number. But the Airtel network deduct N10 for that transfer, if you want transfer airtime from N20 to N1000 they deduct that N10 in your account. Send the SMS below to 432 using the format. "2U (space) Recipient's phone number (space) Amount (space) Pin". Example: Send "2U 07086938095 100 1234" to " 432 " To change your password, send the SMS below to 432 using the format: Pin Old Pin New Pin. Example: Old Pin 1234, New Pin 6324 Send it to 432. Keep connect with us, I will write how you can transfer airtime on MTN, Etisalat and Glo NG. we feel the information How To Transfer Credit On Airtel To Airtel Airtime Transfer (Airtel Me2U Service) that's all. hopefully the information How To Transfer Credit On Airtel To Airtel Airtime Transfer (Airtel Me2U Service) that we have conveyed can provide benefits for you and all visitors of this blog, if any criticism and suggestions please comment. you just read How To Transfer Credit On Airtel To Airtel Airtime Transfer (Airtel Me2U Service) if this article is considered useful and you want to bookmark and share it please use the link https://stephaniefulke.blogspot.com/2015/09/how-to-transfer-credit-on-airtel-to.html and what if you want other information look for another page in this blog.